The pressure is on and I’m not sure if I’m excited or petrified. Ms. Financial Slacker registered me to run in a half marathon this coming January. I started running again a few weeks ago and it’s been tough going. The last time I ran a half marathon, I was 5 years younger and 50 pounds lighter. I now get winded walking out to check the mail. And my feet hurt even after sitting at my desk all day. But I am putting all that aside. My formal training program starts in about 8 weeks, so I have a little time to get back into a level of physical condition to actually begin training. I do have a small advantage in that the race is at sea level and I’ll be training at over 6000 feet. But running where I live is difficult. It’s mostly mountainous terrain coupled with the high altitude. But just like anything worthwhile, running a half marathon requires planning, preparation, and execution. I can already tell you, there will be days when I don’t want to go out and run. There will be times when my body is tired and sore. It’s always easy to find other things to do. But having run a half marathon before, I can say the end result is worth the effort. My first goal in this adventure is simply to finish without getting injured. I will say that now that I’m over 40, my body takes longer to heal, takes longer to get into shape, and just doesn’t respond like it did when I was in my 20’s. If you’re not careful, you can easily get a stress fracture in your foot or hip. I’ve also had neck and back injuries while running. But beyond finishing without injury, I am using the half marathon training to jumpstart a healthy lifestyle. Over the years, I have let things go a little too much and it’s starting to catch up to me. Too much food and alcohol. Not enough exercise and sleep. During training, I expect to lose some weight and introduce healthy eating habits. I can tell you from prior experience, running is much easier when you eat well and stay away from alcohol the night before. In addition to the physical and lifestyle benefits, running is also a great way to clear your mind. I prefer to run without music and instead use the time to think about my day. It’s remarkable how much stress can disappear after a good run. Running helps keep things in perspective. The key is to start slowly, but be consistent. 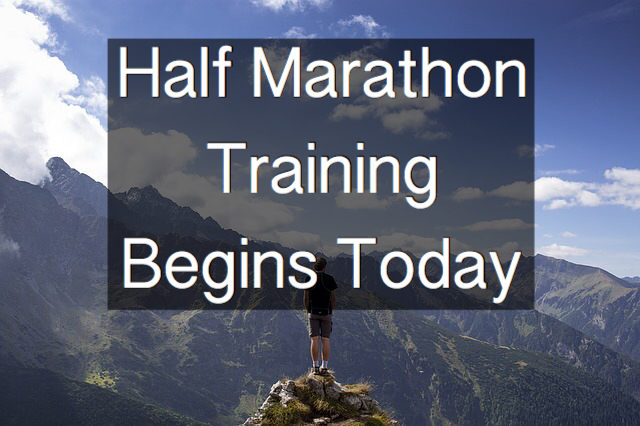 The training program for a half marathon is similar to the full marathon just on a smaller scale. In my training program, I’ll have one long run per week, one middle distance run at about half the distance of the long run, and two shorter runs. During the first few weeks, I’ll be walking more than I’m running. But the key is getting out on a regular basis. I’ll run/walk every other day for the next 7 or 8 weeks until I can get where I can run without stopping for 60 minutes or so. Once the formal training begins, I’ll run 4 days per week. But even then, I will include a fair amount of walking in each session. I find interval training – shorter bursts of higher intensity activity followed by recovery periods – most effective for building endurance with lower risk of injury. Ideally, my longest run will be 10 miles scheduled for 2 weeks prior to the race. On race day, at the lower elevation, with race day excitement, I expect to have enough in reserve to push through to the full 13.1 miles. Set up a regular routine. Just like I said in my post yesterday about my first 100 days of fall blogging, I have found most things are easier if you do them regularly. When you take out the consistency, you lose the habit. And then you are relying on willpower alone for motivation. Create incremental goals. Looking at the entire training schedule is intimidating. It’s hard for me to see myself running 13 miles over two hours. But I can see myself running 3 miles over thirty minutes. That’s my first goal. Once I reach that level, I’ll target running 6 miles in one hour. Not only do the incremental goals give me something reachable to target, they give me the chance to celebrate a victory when I reach them. Take days off when needed. When you’re not used to it, running 3 to 4 days per week over 20 weeks takes its toll on your body. I have learned to listen to my body during training. Especially now that I’m older and heavier, it’s easier than you think to get injured. My approach is to go out and run according to the schedule even if I’m concerned that I may have an injury. Once I’m running, if the pain goes away, I can continue. If it remains or gets worse, I stop. As I mentioned in the beginning, there’s a part of me that’s excited and there’s a part that’s nervous. It’s a big commitment, but the end result is worth it. I’m looking forward to seeing progress over the coming weeks and I’ll let you all know how it’s going. Readers, any other runners out there? Any old, overweight runners? What do you do to stay motivated during training? I am looking for any motivational tips or tricks. And wish me luck! I’ll need it. Congrats on your plan to get back in to running! I’ve run two marathons and a few half-marathons. I had hip surgery a couple years ago and I’m hesitant to try it again. Nothing worse than your hip keeping you up all night long… You are right to listen to your body and rest too. It can get a bit addicting as you get back in shape. It will be fun to watch your progress! I am a little worried about my hip as well. Not to get too complicated, but I have a foot problem and it causes my gait to be slightly off which in turn causes pain in the opposite hip. That’s what stopped me from running a few years ago. I haven’t had the surgery needed to fix all this, but when I was training before, I was also coaching soccer in the evenings. So after running 7 or 8 miles, I would run around playing soccer. I don’t think that helped my hip. I’ll be more careful this time around. Rather you than me Financial Slacker. It sounds like pure torture to me but good on you for doing it. I love the bit about training to get fit enough for the training. At least the altitude and rough terrain you’ll be training in should make you even tougher for the actual event. No doubt, if you survive, you’ll be sharing everything with us. Good luck with it mate. It sounds like torture to me as well. Actually from previous experience, the pre-training part is harder than the formal training. If you can get to a certain level of fitness, the training becomes much more enjoyable. Actually, I am enjoying my 40s more than any other decade. Although the body doesn’t heal as quickly as in my 20s, I don’t put the same pressure on myself as I did in my younger years. Congrats on deciding to run a half marathon! I ran my first half marathon almost a year ago. You’ve got a good training regimen. Starting out slowly and incrementally adding more distance is exactly what I did too. Also, having your last long distance run no closer than 2 weeks from race day is a great idea. The only trouble I found with my training is that as I approached race day after several months of running outdoors, I started to have knee pain. My knees weren’t problematic during the short runs early on in my training, but as I got closer to race day and began to run those 7 – 10 mile long runs, my knees really started to become a problem. The day of the half marathon my knees were shot by about mile 6, but I pushed through and finished in quite a bit of pain. Maybe this is obvious to some runners, but I learned to run more on the balls of my feet as opposed to striking with my heel. The type of shoes can make a difference as well. So my advice since you haven’t run in some years, take it slow and listen to your body. Invest in some good shoes that will help you run in a way that won’t injure you. Good luck! Congratulations on finishing a half. And I hear you. When I ran a half a number of years ago, I started feeling the pain around mile 8. I pushed through, but after I finished, the pain over the next few days was pretty intense. I’m hoping to do a little better training this time around. This is a very timely reminder for me to get my act together and get ready for the season I love most – winter. Skiing takes a toll on the body in many ways, especially the back ( had a back injury about 4 months ago so I need to be careful) and sharpening up my body in preparation for that is a must. I know skiing can be fun and it’s certainly very popular around this area, but we have never been able to work it into our schedule on a regular basis. And as such, when I do go skiing, I’m not in goood enough shape and wind up alternating between working so hard I sweat through my clothes on the way down and freezing on the way back up. Maybe once the kids are done with swimming, we will have more time to start skiing regularly. My kids were involved in martial arts a few years ago and I remember watching the advanced students take those tests you mention. They are pretty intense. Good luck! Great plan. I wish you all the best. Finishing as a goal is great! Listening to your body is important. At my age (40 now) I do that more. It turns out I have bad knees. Unsure where this will take my running. I’ve already startd feeling the pain. We’ll see how this goes.